Well, I promised I would finish out my 3 Day series a while back, but my life has continued to be insanely busy! 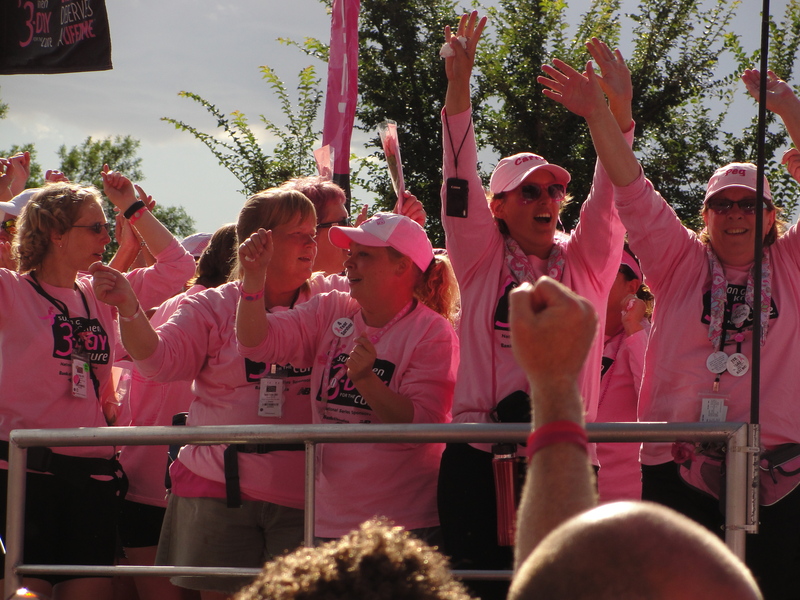 Following #the3day hashtag on twitter during this weekend’s Dallas walk has inspired me to finish writing about my experiences this past year. I started out the 3rd day of the walk barely being able to move. My hip was hurting so bad, I could barely walk – literally! I knew the line for the medic tent would be long, so I got up early, and headed right over. I was able to get in, but had to decide which was worse, my blisters or hip. There wouldn’t be time to get both taken care of. My hip was going to be the bigger problem. I could bandage up my own feet, at least good enough to get me through until the first pit stop. I sat in line for quite a while, and finally was able to see a chiropractor. She fixed me up, and I was able to walk right over to the self-help tent and bandage up my feet. While working on my feet, I ran into two of the women who were on my first training walk in Chippewa Falls. (I thought I had blogged about it, but I couldn’t find it to link it.) We were all walking on tender feet, but we had all made it every mile so far! We've got the capitol in our sights! Getting closer! The rest of our group had been shooed out of camp, so they were already on the road. My Mom and I headed out, and ended up walking “with” a group of people that had a radio with them, and they were blasting The Black Eyed Peas. Since this was some of my main music during training, it pumped me up, and I felt great. We were all singing and dancing our way to that first pit stop. Note to self: Next year, get one of those speakers that connects to belt, and have MP3 player loaded and ready! We met up with our group at the pit stop, ate, filled our water bottles, peed, and kept going. My feet were feeling ok, so I skipped going to the medic tent. The 2nd pit stop, I had to stop to get my feet re-wrapped. My feet were in bad shape! Another girl and I were there getting our feet pretty much completely wrapped. It took so long, they were almost going to have to bus me directly to lunch. There was a “caboose” that rode her bike at the back of the pack. If she caught up to you, you would have to get bused to the next pit stop. Because of how late we were running, it was going to have to be lunch. I had my Mom go ask her to wait. I had made it every mile to that point, and I did NOT want to have to get bused. She came over and told me she would wait just a couple more minutes. I asked the nurse to please hurry popping the blisters and wrapping them up. The caboose was about to get back on her bike when I yelled out, “Go pull her pigtails! Don’t let her get on that bike! !” She came over, and said, “Here’s the deal, the next pit stop closes in 45 minutes. It’s about 2.5 miles away. Do you think you can make it there before it closes?” I guaranteed her I would, and she waited until my toes were wrapped. The first few steps were rough! We learned on Day 2, that immediately after having your feet wrapped, it will feel worse. The first half a mile is tender, but then, you settle back into a stride, get used to the bandages, and you’re good to go. Not only did my mom and I make it to the next pit stop before it closed, but we passed a couple dozen people along the way! The cheering stations on Day 3 were great. We saw some of the same people that had been out the other 2 days, and a bunch of new ones. 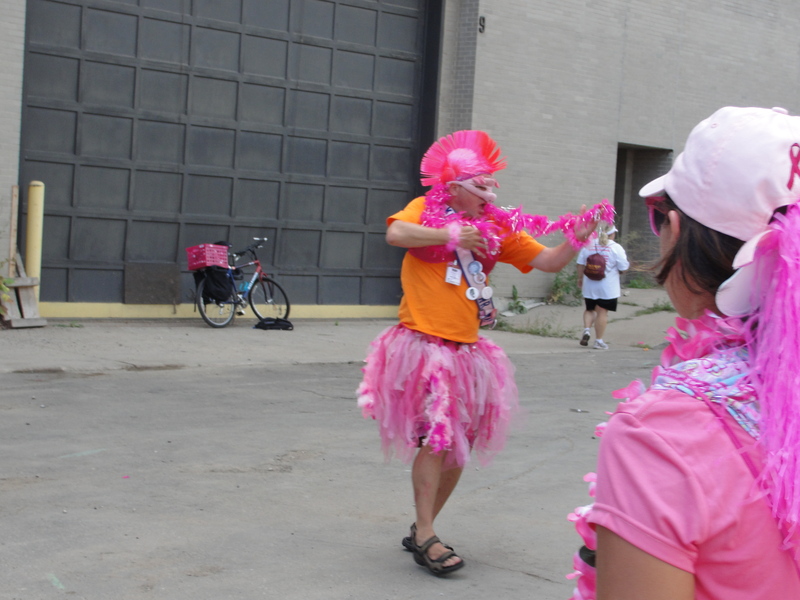 The cheering stations – especially when there were people we knew, were incredibly motivating! The Crew had a ton of energy too that last day. They were so helpful, I tried to thank each one of them along the way! One member of our fabulous safety crew. He had us all laughing every time we saw him. The 2nd half of the day didn’t go so well. At lunch, I discovered I was now growing a huge blister between my toes. I went to AGAIN get my feet re-done. The girl I was in the medical tent with before was also back. She had to have the front half of her shoe cut off. I guess I was lucky mine weren’t that bad! I felt like I was going downhill quickly after that. My steps were slower, my energy was much lower. I’m not sure if I didn’t drink enough or what, but I struggled most of the time from lunch, to the State Capitol. The sweep vans were so tempting to get on and just take a break. Just when those thoughts would come into my head, I would think of all the people that donated money for the cause. Then, I would look at Carrie, who was not only walking with blisters too, but also with scars that remind her daily of her fight against cancer. This was nothing compared to what she’d been through – physically and emotionally. Every step I took was for her, for her mom, for Jason’s grandma, for my friend Jessie’s aunt, for my friend Holli, for my friend Sherrie, for Brigitte and for her sister who lost her battle, for a past family friend who left behind two small children… Every step was painful, but I didn’t have their battles. As I gingerly stepped my way to the closing ceremony, my mom was feeling nauseous. As she was fighting back throwing up, there were people being whisked away by ambulance. There were also many people taking the sweep vans. There’s no shame in taking the sweep van, yet I was still surprised by the number of vans that went by with a “full” sign in the window. I was also surprised by the number of people I saw walking in sandals that last day. In talking to most of them, it was much more comfortable than cramming their swollen, blister filled feet into tight tennis shoes. With the huge blister between my big toe and the next one, there was no way I was going to put on my flip flops! Next year, I think I am going to buy a pair of Teva’s to wear on Day 3 – at least after lunch. Yep, this was one of my feet after the walk! We finally made it into the “holding” area, where we got our shirts for finishing. We then paraded to the capitol grounds. It was so amazing to see how many walkers (2500), and crew (450) there were. 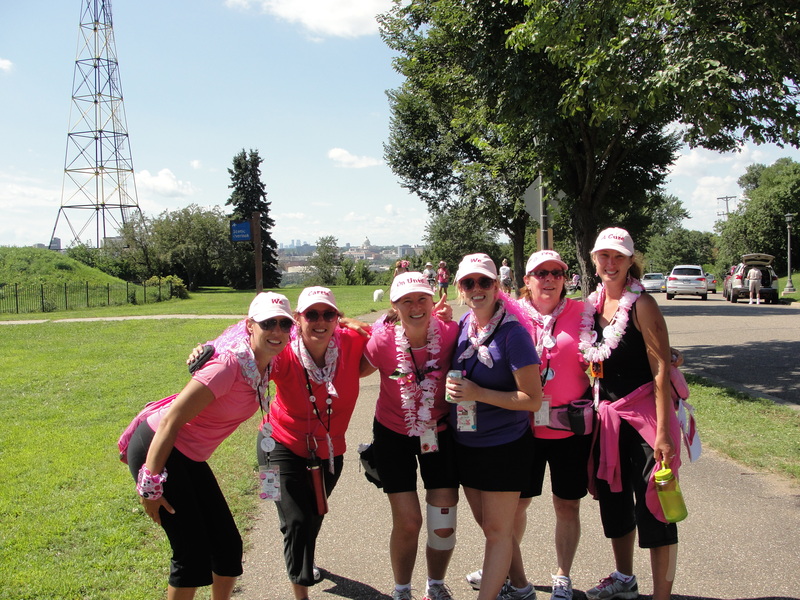 In the Twin Cities, we raised a total of $5.3 million for Susan G Komen. The ceremony was inspiring. The “regular” walkers (with our white shirts) formed a circle around the perimeter of a raised platform where “The Cure” flag would be flown. In between us and the platform, the crew came in (safety had orange shirts, I think all the rest [food, water, loading/unloading, etc] had blue). Finally, all the survivors walked in wearing pink shirts. Everyone kneeled to the ground, raising one shoe in honor of their fights. The survivors filled the platform in the middle. It was a feeling I can’t even describe! Carrie and Peg in the inner circle of survivors. BTW – Yes, I was crazy enough to register to walk again in 2012. 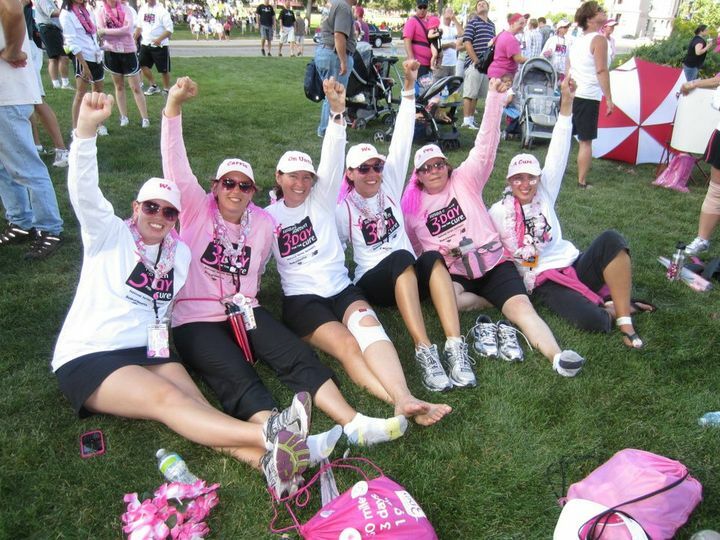 I am hoping members of our previous team will walk again, in addition to other family members and friends who will be joining us to Walk for The Cure! Please consider donating any amount to help me reach my goal of $2500. Sarah’s fundraising page.